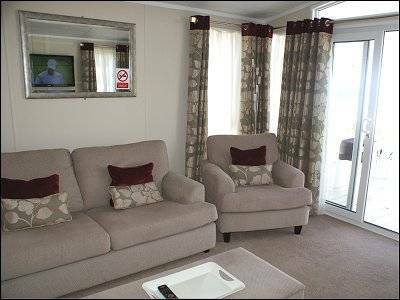 Glamorgan 52 Luxury caravan, Quay West - sleeps 4. 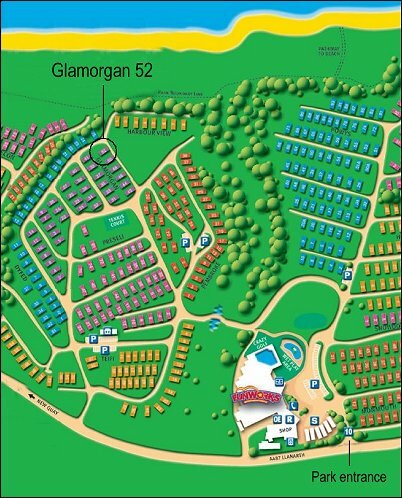 Situated in one of the best front locations in the Quay West Caravan Park, Glamorgan 52 offers a standard of luxury found only in the best caravans. The lounge has 50 inch wall mounted TV, and X Box 360, a family orientated DVD library. 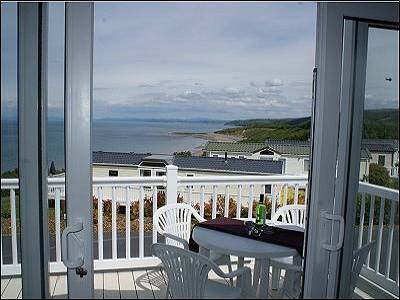 There is a wrap around white deck giving fine views over Cardigan Bay. 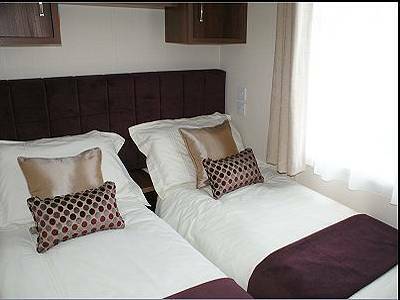 This caravan is only being offered for a limited season in the summer holidays. 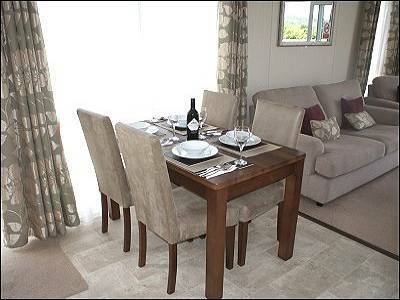 This is a Pemberton Park Lane top of the range luxury 2 bedroom caravan, with full central heating and double glazing and a stunning white deck with outside furniture and a panoramic view of Cardigan Bay. It has a double with a king sized bed flat screen TV with DVD player, and an en-suite shower room with toilet and wash basin. 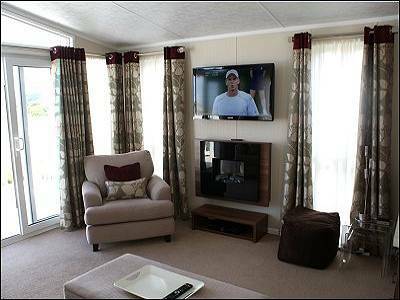 The twin bedroom also has a flat screen TV with DVD player. 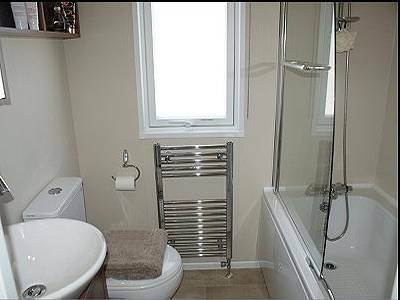 There is a family bath room with a bath with shower over, WC and wash basin. The very well equipped and spacious kitchen has ample cupboards and has a full size gas hob, grill and separate oven, microwave, Tassimo coffee machine, kettle, toaster and large fridge with 3 drawer freezer under. There is an open plan dining area which seats 4, and large living room with free standing sofa and armchairs, a 50 inch Flat screen wall mounted HD TV with Humax recorder. Sliding glass doors open out onto the fully enclosed and gated deck with a table and 4 chairs. 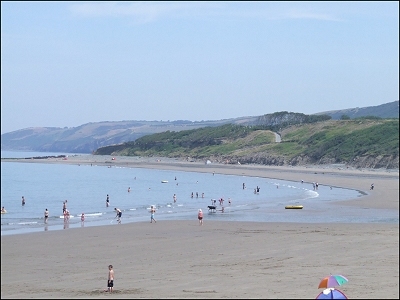 There is off road parking for up to two cars beside the caravan and additional parking areas nearby. Bed linen is not provided. All duvets and pillows are in the caravan. 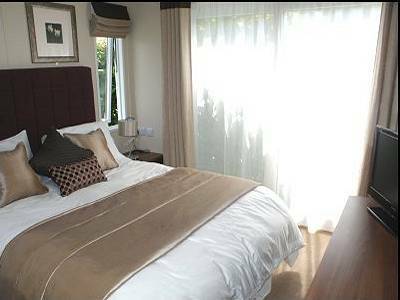 A £100 security / cleaning deposit is required by the owner - to be refunded at the end of your stay if there is no damage, loss or extra cleaning required. 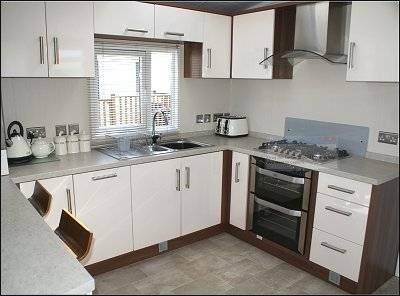 Integrated dishwasher and washing machine / dryer - guests are welcome to use these appliances however, they are not part of the rental package as the holiday home insurance does not cover them so the user would be liable for any repairs required. 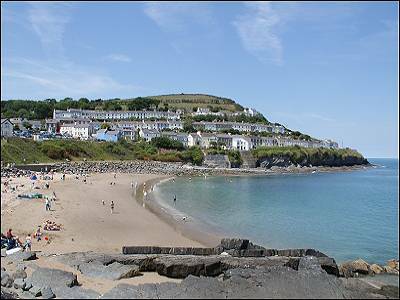 About 5 miles to the north we recommend a walk along the bustling Harbour at Aberaeron with its multi coloured terraced houses, shops and restaurants. Lots of summer festivals are held here. This is a no smoking caravan and pets are not permitted.